For the football team, see Millwall F.C. Millwall is a district of east London, England, on the southwestern side of the Isle of Dogs, in the London Borough of Tower Hamlets. It lies to the immediate south of Limehouse and Poplar, which includes part of the Canary Wharf estate, and has a long shoreline along London's Tideway, part of the River Thames. Millwall had a population of 23,084 in 2011. 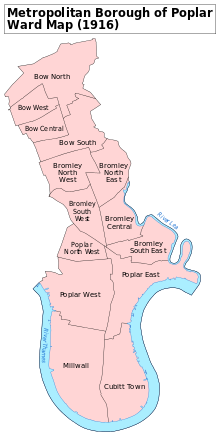 A map showing the Millwall ward of Poplar Metropolitan Borough as it appeared in 1916. Millwall is a smaller area of land than an average parish, as it was part of Poplar until the 19th century when it became heavily industrialised, containing the workplaces and homes of a few thousand dockside and shipbuilding workers. Among its factories were the shipbuilding ironworks of William Fairbairn, much of which survives as today's Burrells Wharf. It was in this era also that Millwall F.C. was founded, in 1885, as Millwall Rovers. First nicknamed 'the Dockers' before becoming 'the Lions', the team moved south of the river to New Cross in 1910, however a set of amateur football pitches remain, adjoining Cubitt Town alongside the City Farm that was added in the 20th century. Originally known as Marshwall, the area acquired its new name with its breakaway from its former parish of Poplar, London. The replacement was due to the large number of windmills built on the river wall in the 19th century. Improvements led by the Lord Mayor William Cubitt in reinforcing the land solved the periodic flooding caused by major snow melt and spring tides. Corn and wheat were brought along the River Thames to be ground into flour there. On 31 January 1858, the largest ship of that time, the SS Great Eastern, designed by Isambard Kingdom Brunel, was launched from Napier Yard, the shipyard leased by Messrs J Scott Russell & Co. The 211 metre (692 ft) length was too wide for the river, and the ship had to be launched sideways. A section of the concrete and timber substructure from the launch site is now preserved on-site for public display at the modern Napier Avenue. Due to the technical difficulties of the launch, this was the last ship of such a size to be built on the island, though other builders such as Yarrows and Samuda Brothers continued building warships on the island for another 50 years. Some of the concrete and timber sub-structure of Great Eastern's launch ramp. In the 1860s the large Millwall Dock was built, extending from the Thames at Millwall into the centre of the Isle of Dogs. The spoil from the dock was left as the Mudchute. During the 19th century, the area now called Island Gardens was referred to as North Greenwich, for the North Greenwich railway station that was opened in 1872 to connect with the ferry that was the forerunner of the Greenwich foot tunnel. The Greenwich peninsula, previously East Greenwich, is now also known by this epithet for the North Greenwich tube station. Like other parts of the Isle of Dogs, substantial redevelopment has been more or less ongoing since the 1980s, resulting in modern industrial and commercial buildings and hastily constructed contemporary housing beginning to predominate over the remaining early 20th century "two up, two down" semi-detached and terraced homes that housed the dock workers, often overcrowded with occupants. Urban neglect has been followed by private housing on former industrial land. This meant a bounce back in terms of population, which fell in the mid 20th century with all the many manufacturing and distributing work which relocated due to the loss of docks and led to a certain amount of reliance with those who remained on council housing followed by social housing. The name "Millwall" retains a negative image owing to associations with the British National Party and football hooliganism, so many residents now refer to the area as simply "the Isle of Dogs" or "Docklands". Millwall is most famous for its football club, Millwall F.C., founded in 1885 as Millwall Rovers. Nicknamed The Dockers (now known as The Lions), the team moved south of the river to New Cross in 1910. Occupying four separate grounds on the Isle of Dogs in the 25 years since its formation as a football club, they now play in Bermondsey and retain the name Millwall despite not having played in the Millwall area for more than 100 years. Millwall Rugby Club was formed in 1995. The first team plays in the Essex Division 1 league and the seconds are in the Essex Merit Table (Division 2), while the thirds are playing in the Merit Table (Division 5), having won Division 6 last season. They now also have women's rugby - the Millwall Venus girls - and a youth section for boys and girls from eight years old. Millwall gained some notoriety when, in a council by-election in 1993, Derek Beackon won the British National Party's first council seat there. After a major anti-fascist campaign, the BNP lost the seat at the following full council election. In September 2004, Tower Hamlets' Respect party fought its second council election in the borough, standing local activist Paul McGarr. In this previously 'solid' Labour seat, Labour were pushed into third place, and the local Conservative party took its first ever seat on Tower Hamlets council. In the 2006 local elections, the Conservatives took all three seats, defeating former MP Alan Amos. The Millwall ward was subsequently abolished in 2014, largely replaced by the new wards of Canary Wharf and Island Gardens. These retained the Conservative leanings of the old Millwall ward, and as of 2018 they each have one Conservative and one Labour councillor. These are the only two Conservative councillors on Tower Hamlets council. The historical Island Gardens, opened on 3 August 1895 by local politician Will Crooks, is located almost in front of the former Greenwich Hospital, the Cutty Sark, National Maritime Museum and Greenwich Park. The Ferry House is a pub on Ferry Street has existed since the Tudor period (1485-1603). The present building dates from 1822, and was used as a drinking establishment by ferry passengers to and from Greenwich until the opening of the Greenwich foot tunnel in 1902. South Quay and Mudchute on the Docklands Light Railway, and Canary Wharf on the London Underground with the Jubilee line serving the Canary Wharf estate. Routes 135, 277, D7, D8, N550 all operate within the area. The nearest pier is Masthouse Terrace Pier for London River Services. Millwall is connected to the National Road Network by the north-south Westferry Road A1206. On the north bank of the River Thames is the National Trail Thames Path for both cyclists and walkers, and the National Cycle Route 1 on the National Cycle Network, running from Dover to Shetland. Wikimedia Commons has media related to Millwall. ^ a b Lindsay. Millwall: A Complete Record, 1885–1991. p. 8. ^ a b "Millwall History". Millwall Football Club. Archived from the original on 1 October 2012. Retrieved 5 September 2010. ^ a b "Millwall origins". The Millwall History Files. Retrieved 28 August 2010. ^ "Port Cities London - "Building the Great Eastern"". Retrieved 17 Apr 2007. ^ Not For Tourists Guide to London 2015. Not For Tourists. 2015. pp. 126–127. ISBN 978-1629146393. ^ Lindsay. Millwall: A Complete Record, 1885–1991. pp. 32–33. ^ "Tower Hamlets Council > Island Gardens". Tower Hamlets Council. Retrieved 25 September 2013. This page was last edited on 3 February 2019, at 13:12 (UTC).